It would be hard to overstate the impact of the early 1940s on the decades to come. In the 1930s, international commerce was weak because of the Great Depression, but the war effort and government spending rocketed the country into a new era of prosperity that the world had never been seen before. 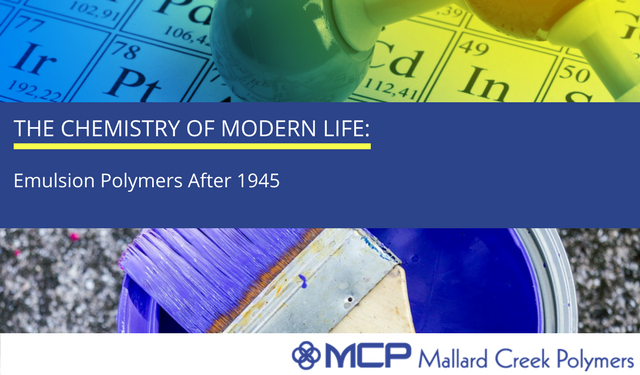 The United States’ newfound chemical know-how created leadership in multiple markets, and the chemistry behind synthetic emulsion polymers was set to expand into markets and products that didn’t exist prior to World War II. The building boom that came with winning the war and the homecoming of hundreds of thousands of military personal created strong demand that permeated throughout the construction and engineering industries. The boom was made more intense by the rise in birth rates and more people needing more stuff. It was an ideal time for someone to develop and commercialize a new chemical process that could greatly simplify the process of a particularly burdensome chore, painting. All those new homes and commercial buildings needed a lot of paint, and this is a great place to pick up the history of emulsion polymers after World War II. Paints prior to the 1950s were all solvent-based, or oil-based, which were difficult to work with. These paints have a strong odor, can be toxic, and are flammable. The cleanup of brushes and spills when using solvent-based paints is a chore most people today are happy to avoid. Cleanup requires white spirits or turpentine, supplies that also require special handling by paint crews. A company called Rohm and Haas pioneered water-based paints in the 1950s, and they built the technology behind this new class of surface coatings from chemistry learned by making Plexigas™, the product it developed and sold profusely to aircraft manufacturers during the war. Similar to the problems of creating styrene and butadiene monomers in the 1930s, polymers which were eventually used to make synthetic-rubber tires for the military in World War II, the process of creating acrylic monomers in the 1940s had limited commercial viability due to its high cost and lengthy production process. Chemists at Rohm and Haas were convinced that the process could be greatly improved to the point where mass production of acrylic monomers was possible, and they persisted with research until the problem was solved. But that created another problem. With the war over, market demand for acrylic had to come from somewhere other than the military, as Plexiglas™ sales had taken a nosedive. Again, chemists and Rohm and Haas used creativity to solve the problem. The company had already developed markets for new waterproof coatings and textile finishes using aqueous emulsion polymers, and it seemed that house paints could be the next highly profitable mega-market. While adoption of water-based paints took time, today (to the relief of home owners and construction crews all over the world) water-based acrylic and especially latex paints formulated with aqueous emulsion polymers dominate the market. Water-based paints have little odor, are non-toxic, and are non-flammable. Brushes and spills clean easily with water. Their ease of application, durability, color-richness and friendliness to the environment are what make homeowners and paint crews happy. Just as synthetic rubber, synthetic latex, water-proof barriers, textile finishes, and water-based paints were developed in the booming age of U.S. industrial might, chemists around the globe adapted and refined the emulsion polymerization process to create new uses, new products and new markets. SC Johnson is credited with polymerization advances that improved floor wax, hence Johnson Wax; Stan Avery was likewise improving pressure-sensitive labels, hence Avery labels; and a number of firms were involved in developing new coatings for paper that today give us superior packaging solutions, vibrant color reproduction, and high-tech thermal papers that thrive as receipt paper. Not only did these new polymer-based products benefit consumers, manufacturers benefited immensely from streamlining production processes, reducing cycle times, and lowering their costs of goods and labor. Today, synthetic, water-based emulsion polymers are everywhere. Scientifically, they can be referred to as carboxylated styrene-butadiene latex, styrene acrylic copolymers, acrylics, or vinyl acetate, among others. For the average consumer, however, it’s just important to know and appreciate that good chemistry is the key to modern life.